High frame rates combined with high resolution increase image data rates massively in high-performance slow-motion and high-speed cameras. It is not uncommon to come across data volumes of several GB per second. 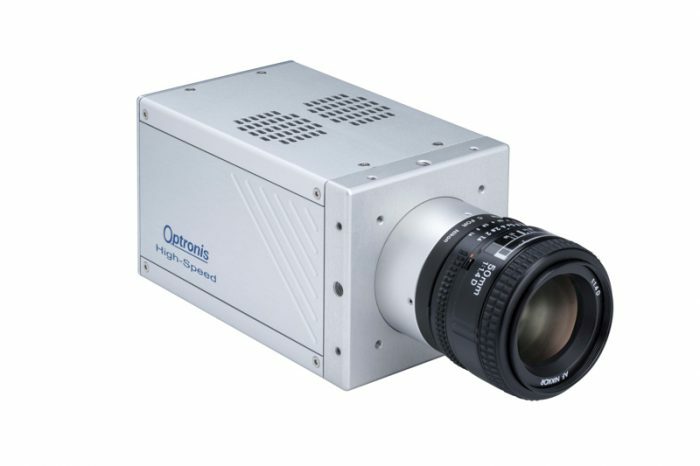 The Sprinter slow-motion camera from the Optronis CamRecord series now offers high-performance, modern data management using a sophisticated storage concept via an SSD backup function. With conventional storage concepts for slow-motion cameras, a RAM memory – usually with 16 GB capacity – is described as being correspondingly fast. But backing up the image data via a GigE interface to a connected PC (offline data transfer) is time-consuming. Despite the refined camera technology, carrying out sequences of measurements is accordingly an involved affair. This is where the SSD backup on the new Sprinter camera from Optronis offers far better performance. An integrated SSD backup allows for considerably faster data transfer time. The SSD concept provides for camera-internal data transfer via a SATA interface at 300 MB per second. That is six times the data speed compared to conventional storage concepts, using the GigE interface to the PC. The CR-S3500 (to give the new Sprinter camera its full product name) with its high performance capability is suitable for making very fast object movements visible, through to simple ballistics. The slow-motion camera achieves an image refresh rate of 3,500 images per second in full format and 12,000 images and a resolution of 1,280 x 240 pixels. In addition to the modern SSD backup, the camera also features a gigabit and wifi interface. This means the Sprinter not only solves highly demanding measurement tasks in fault analysis and quality assurance for particularly fast-moving objects, but also offers every conceivable option for quick and easy data transfer. For more information, please visit http://www.optronis.com.